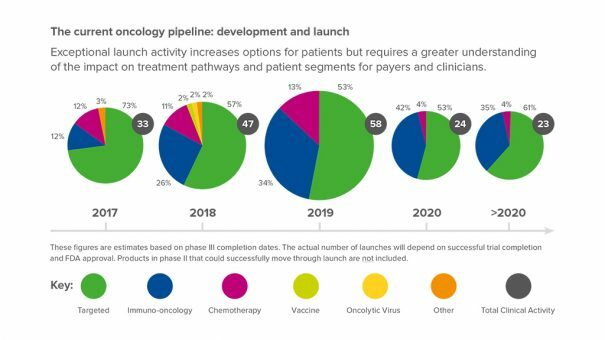 At the end of 2015 there were almost 600 new oncology-related molecules in late-stage development, so it is no surprise that two-years on, the number of therapeutic options in cancer care is growing, and with it the complexity of treatments available. Similarly, for the life science companies introducing these new therapies, the complexity of navigating, supporting and informing payers, HCPs and patients has increased in equal measure. Therefore understanding fully the needs of each of these stakeholder groups is imperative. 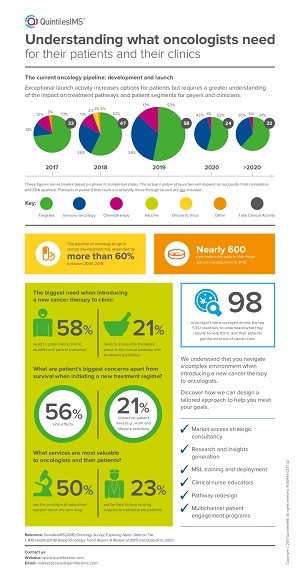 With this in mind IQVIA, the Human Data Science Company, has created a research based infographic on what oncologists want in terms of support around a new cancer therapy. These doctors are faced with various decisions and choices from combinations of well-known drugs to precision medicines and personalized treatments, such as immunotherapies or even cell-based therapies. Some may come with complex changes to clinical pathways, or unfamiliar delivery systems and new side effect patterns. To better understand what information physicians require to help them navigate this explosion in choice and opportunity, in 2016 the IQVIA team surveyed 98 oncologists over the top five EU countries. This infographic examines the results and how insights gathered can help inform your communication strategy, by addressing physicians’ needs around clinical trial data. Whilst also understanding the impact of new treatments and the needs of the patients they serve. While, for more on the latest innovations in the field of oncology, and our focus on what this means for the clinical trial process, please click here to access the Spotlight.